You can never know in advance all the news that will move the market in a given week, but some things you can see coming. From new smartphones hitting the market to a troubled department store chain reporting financial results for the holiday quarter, here are some of the things that will help shape the week that lies ahead on Wall Street. Samsung has emerged as the world's largest smartphone manufacturer. Sorry, iPhone fans, but it's true. Samsung has made the most of the freely available Android operating system to build cutting edge phones and tablets, and these just happen to be the two product categories that have been eating into the growth of desktops and laptops. Samsung is hosting its annual Samsung Unpacked event on Monday, coinciding with the 2014 Mobile World Congress powwow in Spain. It's widely expected that Samsung will introduce the Galaxy S5 smartphone and update its Galaxy Gear smartwatch. It there aren't enough fireworks out of Samsung, it's a safe bet that smaller mobile device makers will try to make waves with new products that they will unveil. Office Depot (ODP) completed its merger with OfficeMax in November, creating an office supply superstore giant with 66,000 associates worldwide ringing up $17 billion in annual sales through its 2,200 retail locations. We'll get our first snapshot on the officially combined company's performance on Tuesday when Office Depot reports its quarterly results. Naturally it's too soon to see the synergies behind the deal start to bear fruit, but analysts see the most profitable quarter out of the company in more than a year with sales topping $4 billion. It's been a bad couple of years for J.C. Penney (JCP). After an unsuccessful stint by a seasoned industry veteran to update the chain in 2012, the department store chain has gone back to its basics in an attempt to woo back the shoppers that have sworn off the retailer. Wall Street's bracing for another sharp loss at the retailer when it reports on Wednesday, and that's something that's rare during the seasonally potent fourth quarter. If you're not turning a profit when holiday shoppers are storming the mall, it's not going to be easy to stay in business. J.C. Penney has shown signs of bottoming out, but it remains to be seen if it has the financial support to see it through a potential turnaround. Energy drinks is one of the few beverage categories that isn't dominated by the world's leading soft drink companies. Red Bull and Monster Worldwide (MNST) have grown into the two top dogs putting out cans of adrenaline-boosting refreshment. Monster reports on Thursday. It took some heat recently on fears of the health ramifications of ingesting too many energy drinks. This has become particularly problematic for children and teens. Activists and even politicians have tried to crack down on energy drink consumption by young sippers, and it's against this backdrop that analysts see double-digit percentage improvement in revenue and earnings, but it should be noted that Monster has missed Wall Street's profit targets in each of the four previous quarters. %VIRTUAL-article-sponsoredlinks%3-D printing has been one of the tech world's most compelling innovations in recent years. 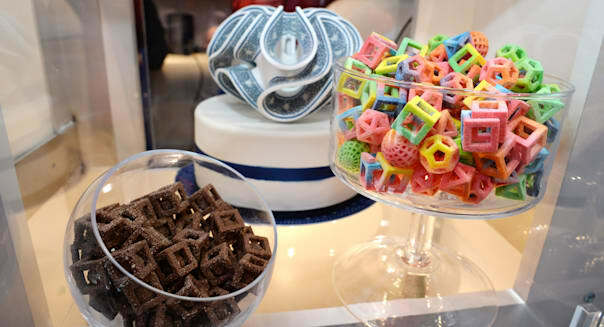 Printers can now crank out actual objects. It's no longer merely science fiction. 3D Systems (DDD) is a leader in this booming niche, and it's naturally been a great stock to own since 2012. It closes out the trading week by posting fourth quarter results. The market's holding out for a 53 percent surge in revenue, as even office supply superstores are starting to stock its entry-level devices. If you have $1,300 burning a hole in your pocket you can pick up 3D Systems' Cube printer at Office Depot. Is there anything that Office Depot doesn't carry these days?